UPFINA's Mission: The pursuit of truth in finance and economics to form an unbiased view of current events in order to understand human action, its causes and effects. Read about our mission here. With the recent weakness in Europe and China, US investors have begun to worry about the potential for a global economic recession. We can’t get in the heads of all investors to determine why they are selling, but we can put two and two together. The US stock market is falling after weak global economic data has come out. The dollar is at a 16 week high as the Fed is more hawkish than the other developed market central banks. The strong dollar is also caused by the slowdown in global economies such as in Europe. Oil prices are down 12 straight days which is a record long streak resulting from forces such as the strong dollar, US removing sanctions from eight countries which increases the supply, and the weak global growth outlook. The bright side to oil’s decline is it will decrease input cost inflation and help the US consumer right before the holiday shopping season. The reason that’s potentially significant is consumption is the main component of GDP. 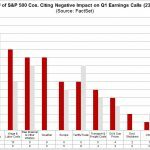 Bank of America Merrill Lynch asked fund managers about the potential for a global recession in 2019 since this risk has been driving U.S. equity prices lower. 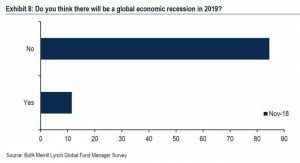 As you can see from the chart below, just over 10% believe there will be a global recession and over 80% don’t think there will be one. The hope for the bullish investors is all these smart money managers are correct. The bad news is this risk isn’t even close to priced in. Economic data needs to weaken more to convince fund mangers there will be a recession. By the time they are convinced, stocks will be much closer to being a buy than now. The bad news is the current trajectory is lower. Fund managers agree there’s economic weakness. 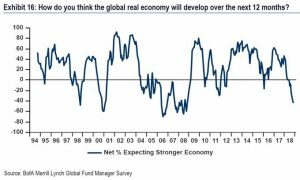 The good news is since the lowest percentage of fund managers are optimistic on real global growth since the financial crisis, if the economy has a turnaround, stocks will soar. The problem here is fund managers have had a good track record of predicting weakness. Very few in 2006 expected real global growth in the next year when the U.S. recession started in late 2007. The chart below shows a net 44% think global growth will slow which is the worst reading since November 2008. It’s odd to see so many fund managers expecting weakness in the next year, but so few expecting a recession. 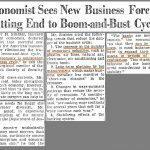 It’s very tough to predict were the economy will go once the slowdown begins. For example, many investors thought America would fall into a recession in early 2016, but the whole economy recovered, whereas some industries experienced declines as we detailed previously. It’s pretty easy to see a slowdown is coming in 2019 because by some accounts it’s already here. As you can see in the chart below, average global manufacturing PMIs have fallen below their long run average for the first time since November 2016. There have been two bouts of weakness since the global financial crisis. Falling below the average is nothing new, but it is disconcerting. 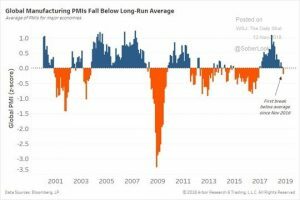 The chart below shows a preview of what might be coming in future global manufacturing PMIs. 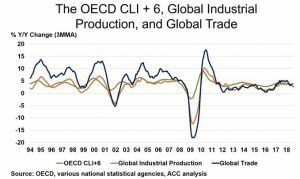 Global industrial production growth is weakening. 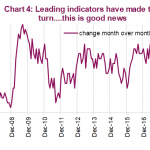 The OECD composite leading indicators shown 6 months forward is predicting more weakness is coming especially for Europe and emerging markets. The Fed rate hikes are hurting emerging markets. The EEM emerging markets ETF is down 24.65% since its peak on January 26th. The European October Markit composite PMI fell from 54.1 to 53.1 which is the lowest growth since September 2016. To be clear, the composite index includes the manufacturing and services indexes. The services index fell from 54.7 to 53.7. The chart below shows the major economies in Europe. Ireland’s PMI was 56.1 which was a 7 month low. France’s PMI was 54.1 which was a 2 month high. Spain’s was 53.7 which was a 4 month high. Those were 2 outliers. We won’t cherry pick data by excluding the good results. Germany’s was 53.4 which was a 5 month low. Italy’s was 49.3 which was a 59 month low. 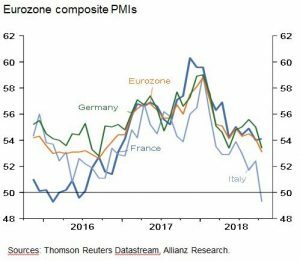 Italy is underperforming during this slowdown after doing poorly during the European expansion. Italy hasn’t recovered its real GDP losses since the peak of the last cycle. Even though Italy and Greece have struggled in the past decade, the IMF estimates Italy is very close to its growth potential and Greece is less than 5% away from its potential. During their secular slowdowns, the IMF has lowered their potential growth. 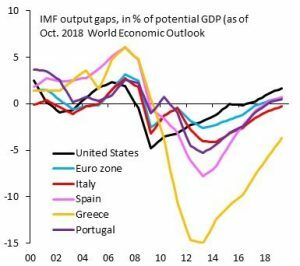 As you can see from the IMF chart below, the US, Spain, Portugal, and the Euro Zone are all estimated to be operating above their output potential. The good news is the peaks last cycle were a bit higher, suggesting that there could be further capacity for growth. The chart below shows another Bank of America Merrill Lynch fund manager poll. 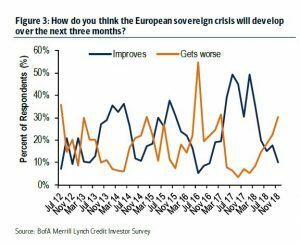 This poll asks investors how they think the European sovereign crisis will develop in the next 3 months. Over 30% think it will get worse and about 10% think it will get better. The biggest problem is Italy, which is staring down a potential recession. This explains the votes in the poll. Singles Day is the Chinese version of Black Friday. It is orders of magnitude bigger than Black Friday. Alibaba had $30.7 billion in sales in 24 hours. Alibaba’s results give us an updated look at the health of the Chinese consumer. 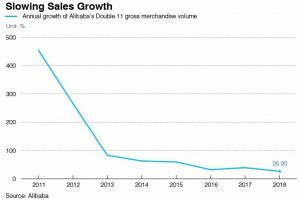 The chart below shows Alibaba’s year over year sales growth. Even though 2018 had record sales, growth slowed to 26.93%. Sales growth was 39% last year. Alibaba stock is down 32.27% since its record peak on June 14th. The Chinese economy is facing a property slowdown. 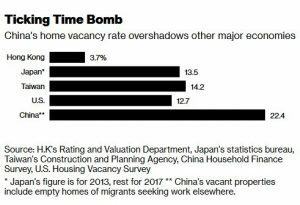 As you can see from the chart below, China’s home vacancy rate is 22.4% which equates to 50 million apartments. 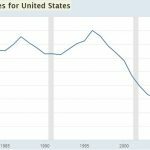 The vacancy rate is almost double America’s rate. The scary part about this is as of Q1 2018, 25.4% of home buys were 3rd homes which signals there is excessive speculation in the market. It 2015, only 7.3% were 3rd homes. Fund managers believe there will be a global slowdown, but there won’t be a recession. The biggest areas of weakness are Europe and emerging markets. The scariest data points are that Italy’s composite PMI fell below 50 which signals shrinking and that 22.4% of Chinese homes are empty while a majority are buying their 2nd and 3rd home. Only 30.8% of home buys in Q1 2018 where 1st homes in China. Have comments? Join the conversation with us on Twitter. NextCan A Positive Yield Curve Signal A Recession? The pursuit of truth in finance and economics to form an unbiased view of current events in order to understand human action, its causes and effects.